Here is the Nokia 8, Again!!! As we inch closer to the August 16 and the unveiling of the Nokia 8, the leaks are flowing steadily. 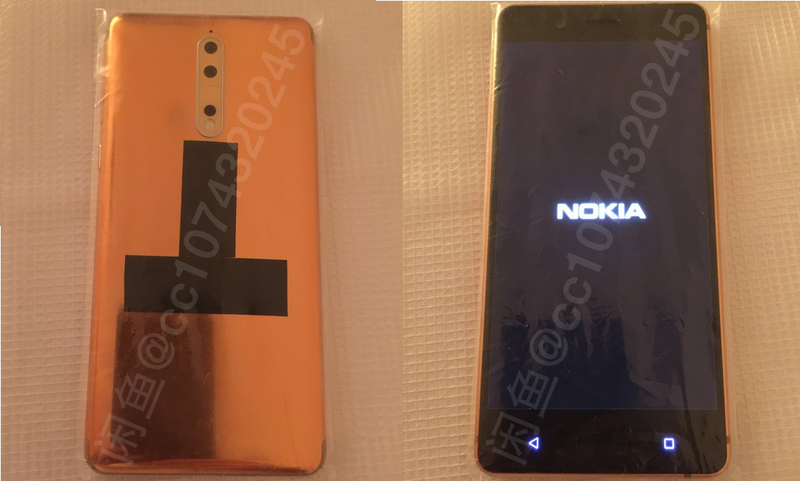 Today we have another set of Images showing off the upcoming Nokia 8 (Copper-Gold variant) from different angles. As you can see in the below image, the Nokia 8 is wrapped up in a transparent plastic package. Again, the back of the device is having dual-cameras with Zeiss optics. Talking about the front it seems that HMD is sticking with physical keys and larger display bezels for the Nokia 8. If you ask me, the device do looks great from the back, but the front is really disappointing. Don't know why only Samsung and LG, so far, seems to have gone all in on killing off bezels. With these huge bezels, we don't think that the Nokia 8 will be able to even touch the standards of Galaxy S8, LG G6, and the upcoming Pixel 2. According to previous leaks, the phone will be priced tad higher. The phone may cost 589 euros (675 USD/ 43500 INR), which would be a steep price considering the trademark of Nokia. The Nokia 8 is said to come with a 5.7-inch 2K, Snapdragon 835 SoC, 4GB of RAM, 64GB internal storage. It will be available in blue, steel (silver), Gold / blue, and gold / copper color options.